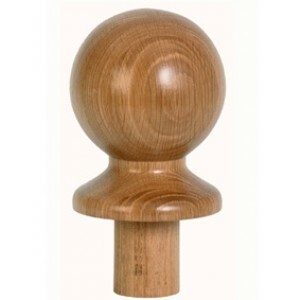 This classic and simple design of newel cap is suitable for a wide range of home styles and is available in a choice of timbers, including pine, ash, hemlock and oak. The ball shape means that these caps could be used to finish a square newel post, for a contrasting look of the round cap with the lines of the newel post, or a turned newel, that would parallel the round shape of the newel cap. These newel caps are from the sumptuous Fernhill range of traditional stair parts for building new staircases or refurbishing old ones. These parts are ideally suited to larger staircases that form an impressive focal point.